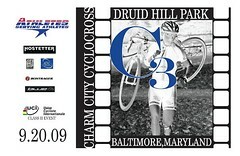 The interviews from this past Sunday’s Charm City Cyclocross that took place at Druid Hill Park in Baltimore, Maryland, are coming in fast and furious. Because several pro riders from the elite field were kind enough to take time out of their incredibly busy schedules to share some knowledge, I am going to change the format of race interviews a bit and push a couple posts out ahead of the field. The first interview I’d like to share is with Adam Myerson. Adam has been a professional bike racer since 2003. He races on the road for Team Mountain Khakis and dons the kit of his coaching business, Cycle-Smart, for cyclocross season. Myerson hit the first two races in the MAC Cyclocross series days after finishing third on the road in the Texas Tough criterium, September 17. He placed second at the MAC opener, Nittany Lion Cross, September 19, and finished third in Sunday’s Charm City Cyclocross. I had an opportunity to ask Adam about the Charm City race. If you are new to racing, or even if you have been at it a while, give this interview a careful read. The amount of coaching, tactics, strategy and training advice stuffed into his responses to eight questions is incredible. The wait is finally over. Cyclocross season gets under way in earnest this weekend. Now is the time to pull those race shoes from the trunk of your car and scrape last December’s mud off the cleats. Time to get the skinsuit out of the mothballs, and to make sure you haven’t used the last of the embrocation.